Sometimes I find when having made something I am not entirely sure if I like it. Especially when it is something I have been planning and thinking about for a while, when I have in my head an idea about how i’d like it to taste and what comes out is a little bit different. One of the things I have discovered in my recent spate of chutney making as well is that the flavour changes quite a bit over the first few days after you make it. There really doesn’t seem much point in tasting it when still warm (not that it stops me!). This one I was really unsure of, but now a while has passed I have decided I really like it. It is a quite different taste from most chutneys, I think the Courgettes have a very particular flavour and that this means when you first taste the chutney it is against what your expectations are. But this one is I think very good and well worth a try. First up cut all the courgettes, skin on, into little cubes (just a bit bigger than 1cm cubed) then put in a collender and cover in a bit of salt. Leave for a couple of hours then rinse thoroughly. Then in a blender whoosh up the chillies, garlic, ginger, onion, oil, spiced and enough cider vinegar to make into a paste. Then in your bit pan heat up the paste for a few minutes making sure it doesn’t dry out. Add the vinegar and sugar and stir until all the sugar is disolved. Add the chopped tomatoes and courgette and cook for about 45 minutes to an hour, or until the mixture has reached the desired consistency. If anyone does try this one please do let me know, honestly interested to see what others think of this one. doing this now, just waiting on courgettes salting but all rest prepared…….shall see and let you know!! hi there…..all finished and it is lush!!! !just the right mix of flavours including a tad of heat from my chillies. I used home grown onion, courgette, tomato and chilli too but only yellow tomatoes as have loooooads all rippeened at once. thanks for sharing this. was also my 1st ever time making chutney. trying a soup later today today…..tomato of course lol. thanks again! I’m glad you liked it. 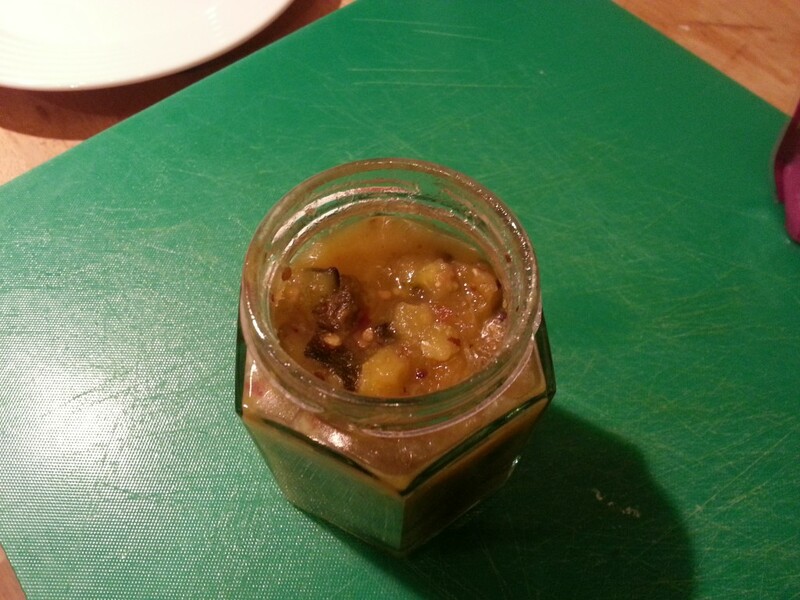 Home made chutneys are great. I find thy are ace gifts to give to people too.